Mohammad Junaid Siddique was born 30 October 1987 in Rajshahi. He is a Bangladeshi cricketer of Pakistani descent. Junaid's grandfather and father originally originate from Sialkot Punjab Pakistan, but migrated to East Pakistan in 1968 which is now Bangladesh during the Bangladesh Liberation War. He is sometimes referred to by his nickname Imrose. A left-handed batsman and occasional right arm off break bowler, he made his debut for Rajshahi Division in 2003/04 and played through the 2006/07 season. He made his Test and ODI debuts during the tour of New Zealand in 2007/08. Junaid Siddique is a left-handed batsman and occasional right-arm offbreak bowler, has represented Rajshahi Division since 2003-04. Decent performances on the domestic circuit earned him a spot in the Bangladesh A side. Junaid was named in Bangladesh's 30-man shortlist for the World Cup but did not make the final 15. Not yet 20, he was called up to Bangladesh's squad for the Twenty20 World Championship in South Africa. Find Junaid Siddique profile and stats of batting, bowling and fielding including latest updated news of Junaid Siddique, videos and images at Hamariweb.com. 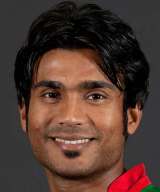 Also find detail Player profile and career statistics of Junaid Siddique of Bangladesh. Junaid Siddique - Find Junaid Siddique of Bangladesh Cricket Team complete player profile, number of matches, runs score, wickets & catches, Statistics, Records, Junaid Siddique Latest News, Junaid Siddique Videos, Junaid Siddique Photos, and other Junaid Siddique Cricket Team players.